A novel approach for in-line solid-phase extraction capillary electrophoresis (SPE-CE) for basic analytes was developed. The method is based on the use of a weak cation-exchange monolith synthesised in situ in the front end of the CE capillary via photoinitiated polymerization to form poly(methacrylic acid-co-ethylene glycol dimethacrylate), which was used to create the SPE phase in-line with the CE separation capillary. The monolithic SPE material exhibited a surface area of 23.1 m2/g and a capacity of 403 nM for dopamine. Adsorption of the analytes as protonated, cationic species onto the SPE phase was achieved using an electrolyte of 6 mM phosphate and 12 mM sodium ion, buffered at pH 7.0, which is above the pKa of the monolith but below the pKa of the analytes. Elution of the analytes from the SPE phase was achieved using an electrolyte with a pH below that of the pKa of the monolith, namely 12 mM phosphate and 12 mM sodium ion, buffered at pH 3.0. 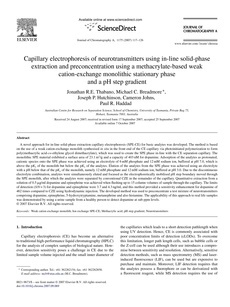 Due to the discontinuous electrolyte combination, analytes were simultaneously eluted and focused as the electrophoretically mobilised pH step boundary moved through the SPE monolith, after which the analytes were separated by conventional CZE in the remainder of the capillary. Quantitative extraction from a solution of 0.5 μg/ml dopamine and epinephrine was achieved when flushing up to 15 column volumes of sample through the capillary. The limits of detection (S/N = 3) for dopamine and epinephrine were 3.7 and 4.3 ng/ml, and this method provided a sensitivity enhancement for dopamine of 462 times compared to CZE using hydrodynamic injection. The developed method was used to preconcentrate a test mixture of neurotransmitters comprising dopamine, epinephrine, 5-hydroxytryptamine, metanephrine and also histamine. The applicability of this approach to real life samples was demonstrated by using a urine sample from a healthy person to detect dopamine at sub-ppm levels.